Former Mead standout Delany Junkermier is taking her game to Ireland. She’ll join Glanmire, which competes in the Irish Superleague, the top league for women in Ireland, later this month. Glanmire is a perennial power, having won seven of the last 13 championships. 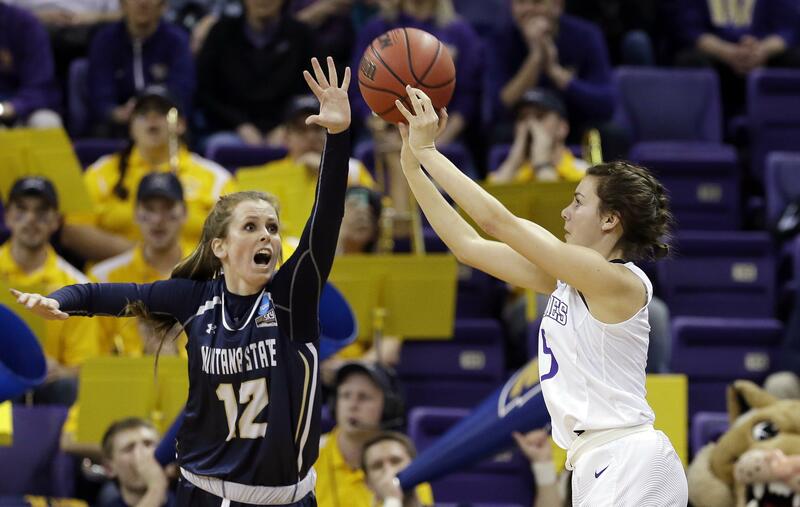 Last season, Junkermier, who graduated with a degree in community health, averaged 11.4 points and 5.2 rebounds for Montana State and was third on the team with 52 3-pointers while shooting 36 percent from beyond the arc. She was All-Big Sky Conference honorable mention. A two-time All-Greater Spokane League selection at Mead, Junkermier finished her college career fourth all-time at MSU in 3-pointers (152) and third all-time in games played (122). Evan Wells, who completed a three-year playing career at Gonzaga in 2009, is returning to the Bulldogs and joining coach Mark Machtolf’s staff as director of player development where he will be primarily responsible for baseball operations, including travel and meals. Wells has had five stops since helping the Zags reach the NCAA Regionals for the first time in more than three decades as a senior. He was an assistant coach last season at Longwood University in Farmville, Virginia, where he worked with hitters and infielders and helped the Division I school to its fourth-straight Big South Conference Tournament appearance. Prior to his year at Longwood, the Olympia native spent five seasons at Dartmouth, a short time at Creighton as a volunteer assistant, a full season at Washington in 2011 after two years at Division III Whitworth. Joelle Mahowald has made history. Community Colleges of Spokane’s 6-foot sophomore middle hitter from Lakeside of Nine Mile Falls is the first player ever honored by the American Volleyball Coaches Association as the Sports Impact/AVCA Player of the Week in the two-year college category. Mahowald, headed to Montana State-Billings next season, is also the first Northwest Athletic Conference Volleyball Athlete of the Week for 2018 following a weekend in which she led the Saquatch to six two-game sweeps. In 12 sets, she had 34 kills, a 53 percent kill efficiency, nine blocks (six solo) and nine service aces. “Joelle led us in almost all categories for the weekend,” said coach Jenni Rosselli-Hull. “Even as a middle, she led the team in kills, which is very rare. She has grown so much since last year. She is proving to be a dominant player in our conference”. • The Washington State men are the only area cross country team to be ranked nationally in U.S. Track & Field and Cross Country Coaches Association preseason polls. The Cougars men are 13th in Division I, the second straight year they’ve had a top-13 preseason ranking. They were 11th last season. The USTFCCCA also ranks teams regionally, and the WSU men are fourth in Division I in the West and the Cougars women are ninth. Idaho’s men and women are both ranked 14th in Division I in the West and Gonzaga’s men are ninth, the Bulldogs’ six straight regional ranking. Washington’s men are 27th nationally and seventh in the West and the women are 18th nationally and fourth in the West. In Division III, Whitworth’s women received votes in the national poll and are ranked fourth in the West and the Pirates men are 10th in the West. It’s the sixth time in nine years the Whitworth teams have been ranked among the West leaders. • Led by women’s cross country, where Whitworth’s defending champions were picked to repeat, Pirates teams were projected by Northwest Conference coaches for no worse than a tie for third in preseason balloting for the fall sports of cross country, soccer, volleyball and football. Whitworth’s men’s cross country team shared the third-place vote with Lewis & Clark behind preseason favorite Willamette. The women were third and the men tied for third in soccer with PLU favored in the former and Whitman and Willamette sharing top honors in the latter. The Pirates were picked second in volleyball after losing their three-year hold on the conference title to Pacific Lutheran, this year’s favorite. The Pirates were tabbed for third in football after finishing second in 2017 with Linfield expected to win a 42nd NWC title. For the second time in three years, Reid Hatley of Hayden Lake is the Washington State Golf Association Men’s Mid-Amateur champion. Hatley, who also won in 2016 and is the reigning three-time WSGA Mid-Amateur Player of the Year, shot 68-72 on the par-72 Rope Rider course at Suncadia Resort in Cle Elum, Washington, last week for a two-shot victory over Jacob Koppenberg of Bellingham, Wash. They were the only players in the full field 120 to break or match par in the ninth annual tournament. Darren Slackman of The Creek at Qualchan tied for sixth at 146 (72-74). Wednesday’s final round in the 36-hole tournament was played on a blustery day, but Hatley overcame a one-stroke deficit to Koppenberg and by the third hole had a lead he didn’t relinquish. “Today was pretty difficult compared to yesterday,” Hatley told the WSGA. “I didn’t look at anyone else’s score until I had hit my second shot on 18 and realized I had a two-shot lead. Washington State baseball – Dylan Steen, RHP, West Valley/College of Southern Idaho, a junior, four-time All-GNL (twice first team) at WV, NJCAA third-team All-American, Region 18 Pitcher of the Year, 12-1, 2.21 ERA, 101 strikeouts in 105.3 innings, 1-0 with six strikeouts in 7 2/3 innings at JUCO World Series as sophomore at CSI; Owen Leonard, RHP, Seattle/Everett CC, a junior; Garrett Gouldsmith, IF, Rio Rancho, New Mexico/University of New Mexico, a sophomore. Whitworth men’s basketball – Michael Coumont, 6-foot-3 G, Freeman, NEA MVP and All-State 1A Tournament as senior, All-NEA as junior, led Scotties to three straight State 1A championship game appearances, averaged 19.1 points, 4.5 rebounds, 2.4 assists as senior; Rowan Anderson, 6-0 PG, Portland; Liam Fitzgerald, 6-7 P, Mililani, Hawaii; J.T. McDermott, 6-5 F, Pleasanton, California; Garrett Paxton, 6-3 W, Kamiakin of Kennewick. Lisa Roman, who completed an award-filled three-year career at Washington State in 2012, has been selected for a second straight year to represent Canada in the women’s eight at the 2018 World Rowing Championships after helping her country take the silver medal in 2017. Published: Sept. 1, 2018, 3:23 p.m.